Mike is the Owner and Lead Instructor at Bossier Jiu-Jitsu. He is a Gracie Jiu-Jitsu Black Belt under 3rd Degree Black Belt Professor Allen Hopkins. His training in martial arts Began in 1999 and in Gracie Jiu-Jitsu in 2003. In 2006, Mike dedicated his full time and devotion to Jiu-Jitsu and started assisting as an instructor. From 2006-2010, he was active in MMA and as a professional from 2007-2010 fighting on Bellator 9 and 18. Mike has also competed at many Jiu-Jitsu tournaments, and is a former Louisiana, Texas, and Arkansas State Champion. Mike holds a Masters degree in Exercise Physiology and is a Certified Strength and Conditioning Specialists (CSCS) through the National Strength and Conditioning Association (NSCA). Jeannie is a Gracie Jiu-Jitsu Brown Belt under Black Belt Mike Braswell. Bassel is a Velha Guarda Jiu Jitsu Purple Belt beneath Team Hopkins Black Belt Mike Braswell. Bassel has attended Jiu Jitsu seminars taught by noted instructors including Master Pedro Sauer, 3rd degree black belt Professor Allen Hopkins, black belts Rener and Ralek Gracie and Matt Strack. Bassel enjoys time with family, training and the outdoors. Joe is a Gracie Jiu-Jitsu Purple Belt under Black Belt Mike Braswell and has been training since 2008. He was awarded his Blue Belt in January 2015 by 3rd Degree Black Belt Allen Hopkins. Joe has been dubbed “Shooter” at the Academy because of his extensive background in firearms which includes 20+ years combined experience in professional gunsmithing & firearms manufacturing. He holds the classification of Grandmaster in United States Practical Shooting Association (U.S.P.S.A.). His professional shooting career has taken him all over the United States, Europe, Africa, and Asia to compete. Frank is a Gracie Jiu-Jitsu Purple Belt under Black Belt Mike Braswell. Joey is a Gracie Jiu-Jitsu Blue Belt under Black Belt Mike Braswell. 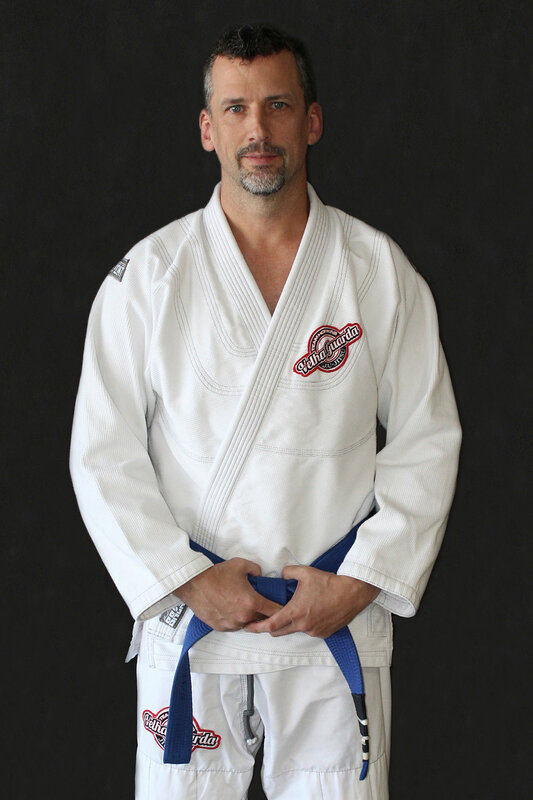 Randy started Jiu-Jitsu in September 2014 at the age of 44. Having been involved in other martial arts (Kung Fu, Tae Kwon Do and Kickboxing) in the past, he now solely trains Jiu-Jitsu and is committed to it for life. He has been married since 1996 and has three daughters that he is passionate about and would rather be with them than anyone else. He works as an Engineer for a technologycompany based out of Atlanta, GA, loves working in his woodshop and in his yard. He also thoroughly enjoys learning Jiu-Jitsu at every opportunity. David is a Gracie Jiu-Jitsu Blue Belt under Black Belt Mike Braswell. Jason is a Gracie Jiu-Jitsu Blue Belt under Black Belt Mike Braswell and has been training Gracie Jiu-Jitsu since 2012. He was awarded his blue belt by 3rd degree black belt Allen Hopkins in Jan 2015. Jason is also a brown belt in Kajukenbo under 3rd Degree Black Belt William Ross. He competed at NAGA and won silver in his division. Jason has attended seminars by Kron Gracie (2), Matt Strack (2), Allen Hopkins (many), and Pedro Sauer. His goal is to compete in at least one grappling tournament every year.